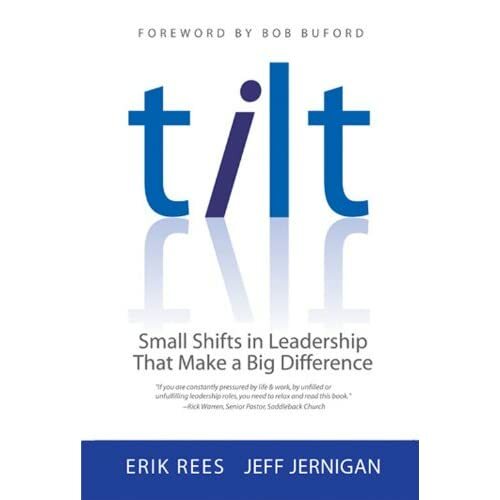 In Tilt: Small Shifts in Leadership that Make a Big Difference, authors Erik Rees and Jeff Jernigan describe the difference between being managed by change and leading it. By choosing the later, we can become part of the process of transformation instead of blocking it. A significant theme throughout the book: too much management and control leads to burn-out. And that deadens all forms of leadership, volunteer as well as professional. The best chapters were on "Becoming an Empowering Leader" and "Value-Driven Behaviors." The importance of inviting new people and investing in them is the first step in empowering others, especially if Christ's ministry is ever to be replicated and multiplied. The strength of the book is the emphasis on behaviors or fruits. The authors do a good job of identifying what they mean by values- driven behaviors, a popular topic in the corporate world. As you begin to establish value-based behaviors, you actually have a good chance of limiting toxic relationships. The best quote was found on page 133: "If visibility is something you need, you need to be in theater, not ministry." You might also find the Appendix, Value-Driven Behaviors Card-Sort a useful exercise for any group or team you lead. The authors tend to lump everyone under the catch-all "ministry." The leadership issues are not the same. Clergy have responsibilities that parishioners do not, for example, in the areas of setting and maintaining healthy space, time, energy, and rest boundaries, both for self and for others. Too, I could have seen fewer grids, graphs, quizzes and inventories, and few more metaphors, biblical and otherwise, developed. Because growth and change is messy- and not just the cause and effect manipulated or "driven"- a more helpful approach would be to focus on the organic, grass roots aspects of transformation. Vision can strangely diminish the more we dissect its parts, rely on general formulas, and ignore the one and only movement of God's Spirit in our midst. That's why I think Tilt falls short as a guide for encountering the Holy One in Christ's ministry. As such, it's more of a leadership manual for the 1990's. More of a last gasp of the purpose-driven technique than a breath of fresh air.